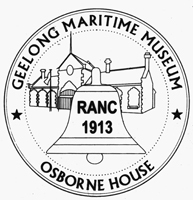 Overlooking Corio Bay, the Geelong Maritime Museum is located in the stable of Osborne House which was built in 1857. The museum has displays looking at the colourful history of Osbourne House which was the site of the first Australian Naval College in 1913 and the first submarine base in 1921. The museum also focuses on the history of Corio Bay as a port. Wheelchair access, gift shop, reference library, guided tours, lecture hall and brochures available. 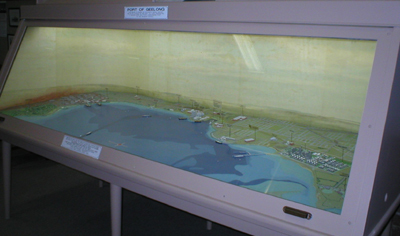 The diorama is interesting to locals especially as it shows depths and channels of the inner harbour and various landmarks of Geelong city and suburbs. The boat is a fifteen foot, intact and fully restored example of the famous "folboat" used by army commandoes in WWII. Operated by two men and launched from submarines, its purpose was to enter enemy waters, inflict damage and return to safety. 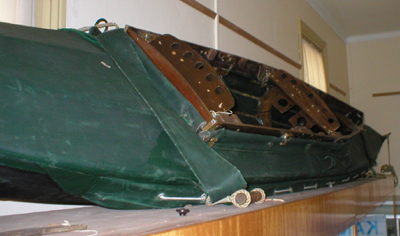 This model was built by the original shipbuilder of the HMAS Kanimbla and was probably placed in a shipping agency's foyer. HMAS Kanimbla originally used an Australian coastal trade. It was commandeered by the navy and had a distinguished WWII career as an armed merchant cruiser and landing ship. It resumed coastal trade after the war. This was the ships' wheel of the local tug boat "Victor" which was broken up. 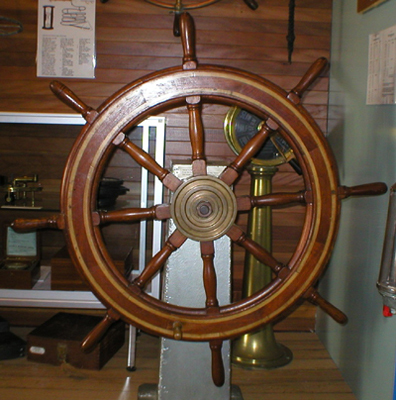 It is a typical example of a ships' wheel used by helmsman all over the world on many types of boats and ships and over many centuries. 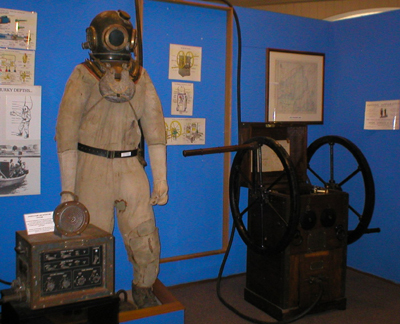 Geelong Harbour Trust used this diving suit to inspect and repair various pylons in the bay.